The Classics department Rumpakis/Dussin Lecture, featuring Stephen Hodkinson, Emeritus Professor of Ancient History at the University of Nottingham and founder of its Centre for Spartan and Peloponnesian Studies. 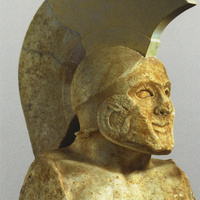 This talk examines the daily lives of the adult male citizens of classical Sparta from the "grassroots," i.e. from the standpoint of rank-and-file Spartiates. Focusing on the diverse range of groups and gatherings in which Spartiates spent their lives, this presentation argues that the standard view that the activities of adult Spartiates were closely controlled from above ignores important features of everyday citizen life, including the large amount of leisure time available to conduct one's private affairs. The multiplicity of groups and gatherings, moreover, led to a diffusion of official control; and the self-regulating character of many of these groups provided all citizens, especially the wealthy, with considerable scope to shape the precise character of their everyday lives.